Sub: School Education - CENTA Teaching Professionals' Olympiad 2017 to be held on December 9, 2017 in India and Dubai - Details given for the Participation of willing Teachers - Inform to all H.Ms and MEOs Requested - Reg. We are very proud to inform that during the TPO 2016 the following teachers from our state had secured high ranks in the National level indicated against them. 1. TPO is an objective, multiple choice and computer-based test to be completed in 2 hours. Subject Knowledge, Classroom Management and Logical Abilities and Communication are the three main sections of the test. 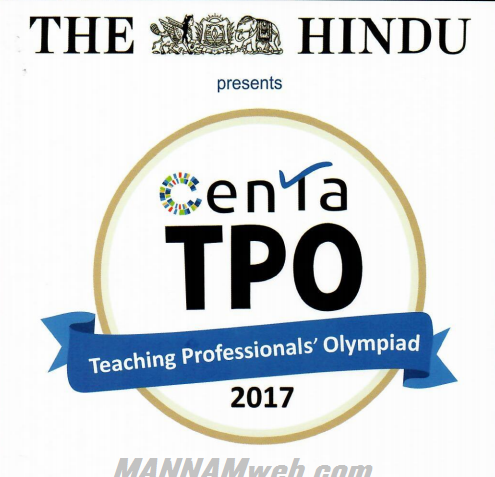 This year teachers can take the Olympiad in Telugu (Primary level only) as well as in English mediums (Primary, U.P and Secondary levels). Telugu• primary mixture of subjects is added to the competition specially to encourage participation of teachers from Andhra Pradesh and Telangana. 2. Results of TPO 2017 will be announced in January 2018. Each participant will receive a detailed confidential performance report which will be accessible only to the participant with a personal user ID and password. Individual reports will not beshared with the school or the education department. (Telugu, Tamil, and Hindi) will get following rewards. Skills and Education Forum to be organized at Dubai. 2017. Registration fees per participant is Rs. 450-00. (Rupees four hundred and fifty only).You can contact +917349662401 (Whats app) for more details about the competition and for queries. In view of the above, you are requested to communicate this information to the H.Ms/Principals of ZP/Govt./Municipal/KGBV/APSWRIES/APTWRIES/APMS/Pvt. Aided or Unaided Schools and to all Primary School Teachers through MEOs and encourage their extensive participation and empower their professional skills.